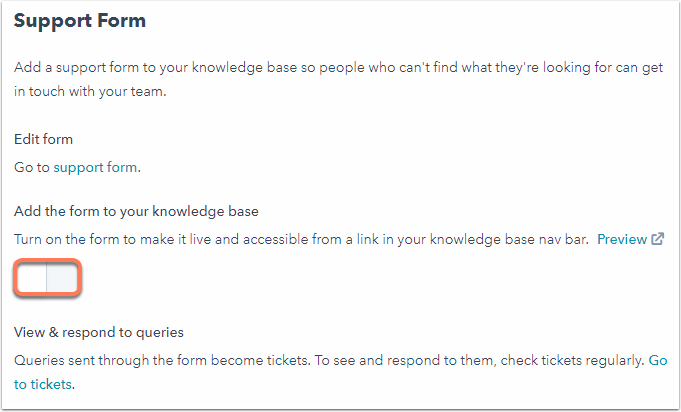 Set up and add a support form to your knowledge base. Visitors can submit this form when they can't find their answers on your knowledge base. These form submissions will create support tickets for your service representatives to follow up with. In the left sidebar menu, navigate to Service > Support form. In the form editor, customize your Default ticket form. This form allows ticket properties to be added as form fields. Once done, in the upper right, click Update Form to take these changes live. In the General tab, Support form section, click to toggle the Add the form to your knowledge base switch on. In the bottom left, click Save. This will add a link to your form in the upper-right corner of your knowledge base. To update the text of the link, click the Customize tab. On the right, update the Text link to your support form. In the bottom left, click Save.